Banks have polluted the economy; it's a matter of equity and efficiency that they clean it up. 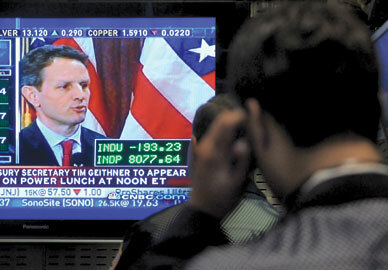 RICHARD DREW/AP A trader watches the treasury secretary from the floor of the New York Stock Exchange. The news that even Alan Greenspan and Senator Chris Dodd suggest that bank nationalization may be necessary shows how desperate the situation has become. It has been obvious for some time that a government takeover of our banking system–perhaps along the lines of what Norway and Sweden did in the ’90s–is the only solution. It should be done, and done quickly, before even more bailout money is wasted. The problem with America’s banks is not just one of liquidity. Years of reckless behavior, including bad lending and gambling with derivatives, have left them, in effect, bankrupt. If our government were playing by the rules–which require shutting down banks with inadequate capital–many, if not most, banks would go out of business. But because faulty accounting practices don’t force banks to mark down all their assets to current market prices, they may nominally meet capital requirements–at least for a while. No one knows for sure how big the hole is; some estimates put the number at $2 trillion or $3 trillion, or more. So the question is, Who is going to bear the losses? Wall Street would like nothing better than a steady drip of taxpayer money. But the experience in other countries suggests that when financial markets run the show, the costs can be enormous. Countries like Argentina, Chile and Indonesia spent 40 percent or more of their GDP to bail out their banks. For the United States, the worry is that the $700 billion appropriated for the bank bailout may turn out to be just a small down payment. The cost to the government is especially important, given the legacy of debt from the Bush administration, which saw the national debt soar from $5.7 trillion to more than $10 trillion. Unless care is taken, government spending on the bailout will crowd out other vital government programs, from Social Security to future investments in technology. There is a basic principle in environmental economics called “the polluter pays”: polluters must pay for the cost of cleaning up their pollution. American banks have polluted the global economy with toxic waste; it is a matter of equity and efficiency that they must be forced, now or later, to pay the price of cleaning it up. As long as the banking sector feels that it will be bailed out of disasters–even ones it created–we will continue to have a moral hazard. Only by making sure that the sector pays the costs of its actions will efficiency be restored. The full costs of those mistakes include not just the $700 billion bailout but the almost $3 trillion shortfall between the economy’s potential output and its actual output resulting from the crisis. Since we are not forcing banks to pay these full costs imposed on society, we should hear no complaints from them about paying for the much smaller direct costs of the bailout. The politicians responsible for the bailout keep saying, “We had no choice. We had a gun pointed at our heads. Without the bailout, things would have been even worse.” This may or may not be true, but in any case the argument misses a critical distinction between saving the banks and saving the bankers and shareholders. We could have saved the banks but let the bankers and shareholders go. The more we leave in the pockets of the shareholders and the bankers, the more that has to come out of the taxpayers’ pockets. There are a few basic principles that should guide our bank bailout. The plan needs to be transparent, cost the taxpayer as little as possible and focus on getting the banks to start lending again to sectors that create jobs. It goes without saying that any solution should make it less likely, not more likely, that we will have problems in the future. By these standards, the TARP bailout has so far been a dismal failure. Unbelievably expensive, it has failed to rekindle lending. Former Treasury Secretary Henry Paulson gave the banks a big handout; what taxpayers got in return was worth less than two-thirds of what we gave the big banks–and the value of what we got has dropped precipitously since. Since TARP facilitated the consolidation of banks, the problem of “too big to fail” has become worse, and therefore the excessive risk-taking that it engenders has grown worse. The banks carried on paying out dividends and bonuses and didn’t even pretend to resume lending. “Make more loans?” John Hope III, chair of Whitney National Bank in New Orleans, said to a room full of Wall Street analysts in November. The taxpayers put out $350 billion and didn’t even get the right to find out what the money was being spent on, let alone have a say in what the banks did with it. TARP’s failure comes as no surprise: incentives matter. Bankers won’t restart lending unless they have a reason to do so or are forced. Receiving billions of dollars in bonus pay for racking up record losses is a peculiar “incentive” structure. Bankers have been accused of unbounded greed using hard-earned taxpayer dollars for bonuses and dividends, but economists more calmly observe: they were simply responding rationally to the incentives and constraints they faced. Even if the banks had not poured out the money in bonuses as we were pouring it in, they might not have restarted lending; they might have just hoarded it. Recapitalization enables them to lend. But there is a difference between the ability to lend and the willingness to lend. With the economy plunging into deep recession, the risks of lending are enormous. TARP did nothing to require or create incentives for new lending, focusing instead on cleaning up past mistakes. We need to be forward-looking, reducing the risk of new lending. Just think of what new lending $700 billion could have financed. Leveraged on a modest ten-to-one basis, it could have supported $7 trillion of new lending–more than enough to meet business’s requirements. Policy-makers have been flailing around, trying to figure out how to get lending restarted. It is not hard to do–if the government bears all or most of the risk. The Federal Reserve is, in effect, making major loans to America’s corporate giants, giving them a big advantage over traditional job creators, America’s small- and medium-size enterprises. We have no idea if the Fed is doing a good job of assessing risk and whether interest rates commensurate with the risks are being charged. Given the Fed’s recent record, there is no reason for confidence. But there is a consensus that whatever the Fed is doing, it is not enough. The Obama administration has floated a number of ideas, from buying the bad assets and putting them into a “bad bank,” leaving it to the government to dispose of them; to providing insurance to the banks; to assisting private investors (like hedge funds) to buy the bad assets, presumably by lending to investors on favorable terms. Because of the lack of details, the market greeted the Obama administration’s announcement of its so-called plan with dismay. As this article goes to press, we can only guess that the administration’s plan will be an amalgam of several of these ideas. The devil is in the details, and without the details we can’t be sure how things will turn out. An early idea floated by Paulson was for the government to buy the bad assets from the banks. Naturally, Wall Street was delighted with this idea. Who wouldn’t want to offload their junk to the government at inflated prices? The banks could get rid of some of these bad assets now, but not at prices they would like. Then there are other assets that the private sector wouldn’t touch with a ten-foot pole. Some of them are liabilities that can explode, eating up government funds like Pac-Man. On September 15 AIG said it was short $20 billion. The next day, its losses had grown to some $85 billion. A little later, when no one was looking, there was a further dole, bringing the total to $150 billion. Then on March 1, the government agreed to another $30 billion in taxpayer money for AIG–the fourth intervention in less than six months. Paulson’s original proposal was thoroughly discredited, as the difficulties of pricing and buying thousands of assets became apparent. More recently a variant of this proposal, which involves government buying garbage in bulk, was broached. But the major difficulty with determining prices of toxic assets, whether singly or in bulk, remains: pay too much and the government will suffer huge losses; pay too little and the hole in the banks’ balance sheets will still seem enormous, requiring another bailout to recapitalize the banks. Most variants of the “cash for trash” proposal are based on putting the bad assets into a bad bank (advocates of the plan prefer the gentler term “aggregator bank”). But the banks holding only good assets would likely be short of cash, even after taxpayers had vastly overpaid for the trash. The hope is that the banks would then find private funds to further the recapitalization, though one suspects that the sovereign wealth funds, to whom many turned a little while ago, would be less interested, having been so badly burned before. I believe that the bad bank, without nationalization, is a bad idea. We should reject any plan that involves “cash for trash.” It is another example of the voodoo economics that has marked the financial sector–the kind of alchemy that allowed the banks to slice and dice F-rated subprime mortgages into supposedly A-rated securities. Somehow, it is believed that moving the bad assets around into an aggregator bank will create value. But I suspect that Wall Street is enthusiastic about the plan not because bankers believe that government has a comparative advantage in garbage disposal but because they hope for a nontransparent bonanza from the Treasury in the form of high prices for their junk. If the government takes over banks that don’t meet the minimum capital requirements, placing them in federal conservatorship, then these pricing problems are no longer important. Under this scenario, pricing is just an accounting entry between two pockets of the government. Whether the government finds it useful to gather all the bad assets into a bad bank is a matter of management: Norway chose not to; Sweden chose to. But Sweden wasn’t foolish enough to try to buy bad assets from private banks, as many in America are advocating. It was only under government ownership of the entire bank that the bad bank was created. Norway’s experience was perhaps somewhat better, but the circumstances were different. Given the complexity and scale of the mess Wall Street has gotten us into, I suspect we will want to gather the problems together, net out the derivative positions (something that will be much easier to do under conservatorship and a significant achievement in its own right, with major benefits in risk reduction) and eventually restructure and dispose of the assets. More recently, another idea has been put forward: the government would insure bank losses. By removing the risk of loss, the value of these toxic assets automatically increases, improving the banks’ balance sheets. Bankers love this idea. The government can give them a big insurance policy at a small premium. Politicians love this idea too: there is at least a chance they will be out of Washington before the bills come due. But that’s precisely the problem with this approach: we won’t know for years what it would do to the government’s balance sheet. Six months ago, what the banks told us about their losses going forward was totally off the mark. AIG had to revise its losses by tens of billions of dollars within days. Real estate prices might fall only another 5 percent, or they could fall another 25 percent. With the insurance proposal, neither the government nor the banks have to admit the size of the hole in the banks’ balance sheets. It’s another example of those nontransparent transactions that got Wall Street into trouble. Even worse, the insurance proposal exacerbates incentive distortions–it moves us from a zero-sum world into a negative-sum world, where increased taxpayer losses are greater than Wall Street’s gains. The insurance proposal may even inhibit banks from restructuring mortgages, worsening the problem that gave rise to the crisis in the first place. If they restructure the mortgage, they have to book a loss. If they keep the mortgage and things get worse (the likely scenario), the taxpayer picks up most of the downside risk; but if things get better and prices improve, the banks keep the gains. Still worse are proposals to try to enlist the private sector to buy the trash. Right now, the prices the private sector is willing to pay are so low that the banks aren’t interested–it would make apparent the size of the hole in banks’ balance sheets. But if the government insures private-sector investors–and even makes loans at favorable terms–they’ll be willing to pay a higher price. With enough insurance and favorable enough loan terms, presto! We can make our banks solvent. But there is a sleight-of-hand here: go back to the zero-sum principle. The private sector is not going to provide money for nothing. It expects a return for providing capital and bearing risk. But its cost of capital is far higher than that of government. The losses are real, and the private sector won’t bear them without full compensation. This means that the amount the government is likely to have to pay in the end is all the greater. This proposal, like so many others emanating from the banking community, is based partially on the hope that if banks make things sufficiently complex and nontransparent, no one will notice the gift to the banking sector until it is too late. It appears as if they are at last getting the high market prices that they hoped they would get all along. But it would be a misnomer to call these market prices, since the government has taken away the downside risk. This proposal has, of course, the further advantage of drumming up support from the hedge funders, who so far have not received any of the TARP bonanza. There is an underlying problem facing all these proposals: the hole in the banks’ balance sheets is bigger than the $700 billion Congress has approved–and much of what has been spent so far has been wasted. So the financial wizards are turning to tried and true gimmicks–the same ones that got us into the mess. One strategy is to hide the costs in nontransparent accounting (easier under the insurance proposal). The other combines this trickery with the magic of leveraging and pretends that leveraging carries no risk. The government sets up a “special investment vehicle” using, say, $100 billion of TARP as the “equity.” It then borrows another $900 billion from the Fed–which in rapid succession has been tripling and quadrupling its balance sheet. Of course, in doing so the Fed is risking taxpayers’ money–but without having to ask permission of Congress. At best, this is a deliberate circumvention of democratic processes. Firms often get into trouble–accumulating more debt than they can repay. There is a time-honored way of resolving the problem, called “financial reorganization,” or bankruptcy. Bankruptcy scares many people, but it shouldn’t. All that happens is that the financial claims on the firm get restructured. When the firm is in very bad trouble, the shareholders get wiped out, and the bondholders become the new shareholders. When things are less serious, some of the debt is converted into equity. In any case, without the burden of monthly debt payments, the firm can return to profitability. America is lucky in having a particularly effective way of giving firms a fresh start–Chapter 11 of our bankruptcy code, which has been used repeatedly, for example, by the airlines. Airplanes keep flying; jobs and assets are preserved. Under new management, and without the burden of debt, the airline can go on making a contribution to our society. Banks differ in only one respect. The failure of a bank results in particular hardship to depositors and can lead to broader problems in the economy. These are among the reasons that the government has provided deposit insurance. But this means that when banks fail, the government comes in to pick up the pieces–and this is different from when the local pizza parlor fails. Worse still, long experience has taught us that when banks are at risk of failure, their managers engage in behaviors that risk losing even more taxpayer money. They may, for instance, undertake big bets: if they win, they keep the proceeds; if they lose, so what?–they would have died anyway. That’s why we have laws that say when a bank’s capital is low, it should be shut down. We don’t wait for the till to be empty. Because the government is on the hook for so much money, it has to take an active role in managing the restructuring; even in the case of airline bankruptcy, courts typically appoint someone to oversee the restructuring to make sure that the claimants’ interests are served. Usually, the process is done smoothly. The government finds a healthy bank to take over the failed bank. To get the healthy bank to do this, it often has to “fill in the hole,” making up for the difference between the value of what the bank owes depositors and the value of the bank’s assets. It’s no different from an ordinary takeover or merger, except the government facilitates the process. Typically, in the process, shareholders get wiped out, and often the government and/or private investors may put in additional money. Occasionally, the government can’t find a healthy bank to take over the failed bank. Then it has to take over the failed bank itself. Usually, it restructures the bank, shutting down many of the branches and lending departments with particularly bad track records. Then it sells the bank. We can call this “temporary nationalization” if we want. But whatever we call it, it’s no big deal. Not surprisingly, the banks are trying to scare us into believing that it would be the end of the world as we know it. Of course, it can be done badly (Lehman Brothers, for example). But there are far more examples of it being done well. The current situation is only slightly different. There are few healthy banks to take over the very many unhealthy banks, and the banks are in such a mess–and the economy is in such a downturn–that we don’t really know how much money would be needed. We don’t know if claims by depositors are greater than the value of assets, and if so, by how much. The banks may claim, If we hold the assets long enough, and if the real estate market recovers, and if our recession isn’t too deep or long, then we can meet all our obligations. We are “solvent.” We just can’t get the cash we need. The banks obviously don’t want the government to play by the rules. They want to delay the day of reckoning. They want what is called forbearance. They say, Allow us a little slack now, because we are fundamentally sound. Of course they would say that. Of course banks claim that market prices underestimate true values. We learned the hard way in the S&L crisis, however, that delay is very costly. We are on track to learn that lesson again. The Obama administration seems to be proposing a way out of this muddle: we will “stress test.” We will see how well you fare. If you pass the test, we will help you get out of your temporary difficulties. Stress testing involves using mathematical models to see what happens under various scenarios. The banks were supposed to have been stress testing themselves on an on-going basis. Their models said everything was fine and dandy. We know those models failed. What we don’t know is whether the models the administration will use will be any better. Will they use the old, failed models? We have been told that it will take time to do the stress test, and while we wait, will we pour more money into failing institutions, with good money chasing bad, ever widening our national debt. We know, too, that the worst-case scenarios that will be used in the stress test are nowhere near the worst-case scenarios that some economists are depicting–implying that even banks that pass the stress test may need more funding down the line. Gradually America is realizing that we must do something–now. We already have a framework for dealing with banks whose capital is inadequate. We should use it, and quickly, with perhaps some modifications to take care of the unusual nature of today’s problems. There are several ways we can proceed. One innovative proposal (variants of which have been floated by Willem Buiter at the London School of Economics and by George Soros) entails the creation of a Good Bank. Rather than dump the bad assets on the government, we would strip out the good assets–those that can be easily priced. If the value of claims by depositors and other claims that we decide need to be protected is less than the value of the assets, then the government would write a check to the Old Bank (we could call it the Bad Bank). If the reverse is true, then the government would have a senior claim on the Old Bank. In normal times, it would be easy to recapitalize the Good Bank privately. These are not normal times, so the government might have to run the bank for a while. Meanwhile, the Old Bank would be left with the task of disposing of its toxic assets as best it can. Because the Old Bank’s capital is inadequate, it couldn’t take deposits, unless it found enough capital privately to recapitalize itself. How much shareholders and bondholders got would depend on how well management did in disposing of these assets–and how well they did in ensuring that management didn’t overpay itself. The Good Bank proposal has the advantage of avoiding the N-word: nationalization. Some believe a more polite term, “conservatorship” as it was called in the case of Fannie Mae, may be more palatable. It should be clear, though, that whatever it is called, the Good Bank proposal entails little more than playing by longstanding rules, a variant of standard practices to deal with firms whose liabilities exceed their assets. Those who say the government cannot be trusted to allocate capital efficiently sound unconvincing these days. After all, it’s not as though the private sector did a very good job. No peacetime government has wasted resources on the scale of America’s private financial system. Wall Street’s incentives structures were designed to encourage shortsighted and excessively risky behavior. The bankers were supposed to understand risk, but they did not understand the most elementary principles of information asymmetry, risk correlation and fat-tailed distributions. Most of them, while they may have been ethically challenged, were really guided in their behavior by the perverse incentives they championed. The result was that they did not even serve their shareholders well; from 2004 to 2008, net profits of many of the major banks were negative. There is every reason to believe that a temporarily nationalized bank will behave much better–even if most of the employees are still the same–simply because we will have changed the perverse incentives. Besides, a government-run bank might spend some time and money teaching its employees about risk management, good lending practices, social responsibility and ethics. The experience elsewhere, including in the Scandinavian countries, shows that the whole process can be done well–and when the economy is eventually restored to prosperity, the profitable banks can be returned to the private sector. What is required is not rocket science. Banks simply need to get back to what they were supposed to do: lending money, on a prudent basis, to businesses and households, based not just on collateral but on a good assessment of the use to which borrowers will put the money and their ability to repay it. Meanwhile, there needs to be an orderly plan for disposing of the old bad assets. There is no magic in moving them around from one owner to another. In some countries, government agencies (often hiring private subcontractors) have done a good job of selling off the assets. Other countries (including some hit in the East Asia crisis a decade ago) have had an unfortunate experience, bringing in investment banks and hedge funds to dispose of their assets. These institutions simply held them for the short time it took the economy to recover and made a huge capital gain at the expense of the country’s taxpayers. To add insult to injury, some even took advantage of tax havens to avoid paying taxes on those huge profits. These experiences suggest caution in turning to hedge funds and other investment firms. Every downturn comes to an end. Eventually we will be able to sell the restructured banks at a good price–though, one hopes, not one based on the irrational exuberant expectation of another financial bubble. The notion that we will make a profit from the bailouts–which the financial sector tried to convince us were “investments”–seems to have dropped from public discourse. But at least we can use the proceeds of the eventual sale of the restructured banks to pay down the huge deficit that this financial debacle will have brought onto our nation. Joseph E. StiglitzJoseph E. Stiglitz is a Nobel laureate in Economics, University Professor at Columbia University and Chief Economist of the Roosevelt Institute.